Folks on the left sometimes act as if the Nordic nations somehow prove that big government isn’t an impediment to prosperity. As I’ve pointed out before, they obviously don’t spend much time looking at the data. So let’s give them a reminder. 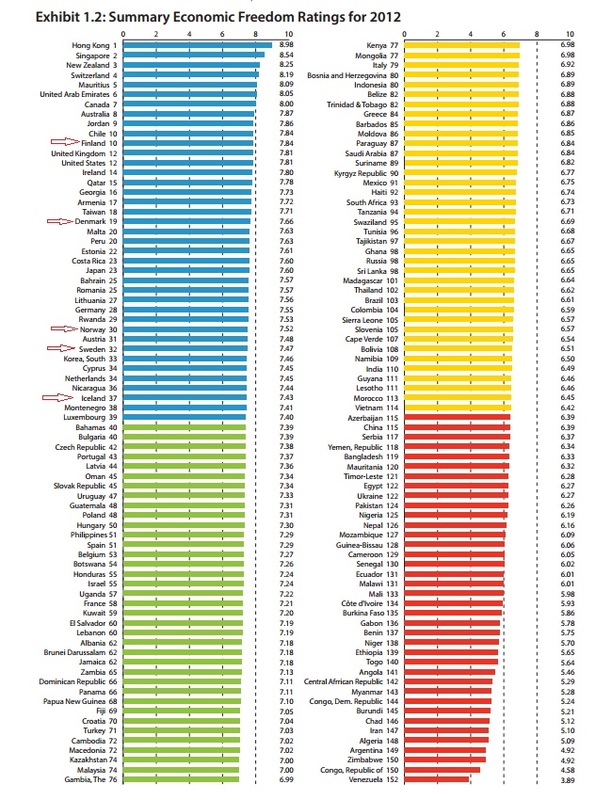 Here are the rankings from Economic Freedom of the World. I’ve inserted red arrows to draw attention to the Nordic nations. As you can see, every single one of them is in the top quartile, meaning that they aren’t big-government jurisdictions by world standards. Moreover, Finland ranks above the United States. Denmark is higher than Estonia, which is often cited a free-market success story. And all of them rank ahead of Slovakia, which also is known for pro-growth reforms. To be sure, this doesn’t mean the Nordic nations are libertarian paradises. Far from it. Government is far too big in those countries, just as it is far too big in the United States, Switzerland, New Zealand, Canada, and other nations in the top quartile. Which is tragic since the burden of government spending in North America and Western Europe used to be just a fraction of current levels – even in nations such as Sweden. The way I’ve described the Nordic nations is that they have bloated and costly welfare states but compensate for that bad policy by being very free market in other policy areas. But you don’t need to believe me. Nima Sanandaji has just written an excellent new monograph for the Institute of Economic Affairs in London. Entitled Scandinavian Unexceptionalism: Culture, Markets and the Failure of Third-Way Socialism, Nima’s work explains how the Nordic nations became rich during an era of small government and free markets, how they then veered in the wrong direction, but are now trying to restore more economic freedom. Here are some key excerpts, starting with some much-needed economic history. Scandinavia’s success story predated the welfare state. …As late as 1960, tax revenues in the Nordic nations ranged between 25 per cent of GDP in Denmark to 32 per cent in Norway – similar to other developed countries. …Scandinavia’s more equal societies also developed well before the welfare states expanded. Income inequality reduced dramatically during the last three decades of the 19th century and during the first half of the 20th century. Indeed, most of the shift towards greater equality happened before the introduction of a large public sector and high taxes. …The phenomenal national income growth in the Nordic nations occurred before the rise of large welfare states. The rise in living standards was made possible when cultures based on social cohesion, high levels of trust and strong work ethics were combined with free markets and low taxes….the Nordic success story reinforces the idea that business-friendly and small-government-oriented policies can promote growth. Here’s a chart from the book showing remarkable growth for Sweden and Denmark in the pre-welfare state era. Nima has extra details about his home country of Sweden. 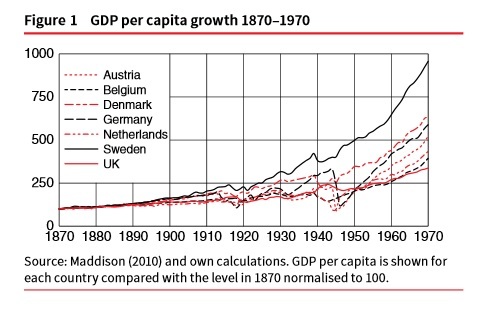 In the hundred years following the market liberalisation of the late 19th century and the onset of industrialisation, Sweden experienced phenomenal economic growth (Maddison 1982). Famous Swedish companies such as IKEA, Volvo, Tetra Pak, H&M, Ericsson and Alfa Laval were all founded during this period, and were aided by business-friendly economic policies and low taxes. Unfortunately, Nordic nations veered to the left in the late 1960s and early 1970s. And, not surprisingly, that’s when growth began to deteriorate. The third-way radical social democratic era in Scandinavia, much admired by the left, only lasted from the early 1970s to the early 1990s. The rate of business formation during the third-way era was dreadful. Again, he has additional details about Sweden. Sweden’s wealth creation slowed down following the transition to a high tax burden and a large public sector. …As late as 1975 Sweden was ranked as the 4th richest nation in the world according to OECD measures….the policy shift that occurred dramatically slowed down the growth rate. Sweden dropped to 13th place in the mid 1990s. …It is interesting that the left rarely discusses this calamitous Swedish growth performance from 1970 to 2000. The good news is that Nordic nations have begun to shift back toward market-oriented policies. Some of them have reduced the burden of government spending. All of them have lowered tax rates, particularly on business and investment income. And there have even been some welfare reforms. But there’s no question that the welfare state and its concomitant tax burden are still the biggest problem in the region. Which is why it is critical that Nordic nations maintain pro-market policies on regulation, trade, monetary policy, rule of law and property rights. Scandinavian countries have compensated for a large public sector by increasing economic liberty in other areas. During recent decades, Nordic nations have implemented major market liberalisations to compensate for the growth-inhibiting effects of taxes and labour market policies. Let’s close with what I consider to be the strongest evidence from Nima’s publication. He shows that Scandinavians who emigrated to America are considerably richer than their counterparts who stayed put. Median incomes of Scandinavian descendants are 20 per cent higher than average US incomes. It is true that poverty rates in Scandinavian countries are lower than in the US. However, the poverty rate among descendants of Nordic immigrants in the US today is half the average poverty rate of Americans – this has been a consistent finding for decades. In fact, Scandinavian Americans have lower poverty rates than Scandinavian citizens who have not emigrated. …the median household income in the United States is $51,914. This can be compared with a median household income of $61,920 for Danish Americans, $59,379 for Finnish-Americans, $60,935 for Norwegian Americans and $61,549 for Swedish Americans. There is also a group identifying themselves simply as ‘Scandinavian Americans’ in the US Census. The median household income for this group is even higher at $66,219. …Danish Americans have a contribution to GDP per capita 37 per cent higher than Danes still living in Denmark; Swedish Americans contribute 39 percent more to GDP per capita than Swedes living in Sweden; and Finnish Americans contribute 47 per cent more than Finns living in Finland. In other words, when you do apples to apples comparisons, either of peoples or nations, you find that smaller government and free markets lead to more prosperity. That’s the real lesson from the Nordic nations. P.S. Just in case readers think I’m being too favorable to the Nordic nations, rest assured that I’m very critical of the bad policies in these nations. Just look at what I’ve written, for instance, about Sweden’s healthcare system or Denmark’s dependency problem. But I will give praise when any nation, from any part of the world, takes steps in the right direction. And I do distinguish between the big-government/free-market systems you find in Nordic nations and the big-government/crony-intervention systems you find in countries like France and Greece. Which countries with supposedly ideal government size provide the population (populations of similar constitution of workers) with the same IHDI rankings/quality of life of those? Including countries like NZ, Australia, Canada, UK. Facts, proof and science don’t matter to pro(re)gressives. It’s the “feel good result” they get out of taxing people to death that matters to them. «The yearly economic growth in average GDP per capita, in fixed 1985 international prices, was in Norway from 1950 to 1960 2.6 percent. This is lower than the average of 3.3 percent for all OECD countries. It is on par with Sweden, Denmark and Iceland, but lower than Finland, which had an annual growth of 4.0 percent. “Ok now let’s concentrate on redistributing it a little more evenly”. Off you peel off into the lower growth club. It is very difficult to reverse this decision. Because, as a voter, the more you lose your once enviable prosperity, the more you desperately turn to government as the only entity that can immediately redistribute and restore some of your former prosperity.Redistribution gives near immediate gratification. But it is a one time finite effect and now your country is in a perpetually compounding growth deficit. An economic death spiral towards becoming a middle income country. If you follow the higher growth path, you might have to wait a good five years or so, for growth to compound and see the same level of personal benefit as immediate redistribution yields. But now you have perpetually compounding growth, and hopefully, a social capital virtuous cycle. Things are very unstable when it comes to these decisions. That is why they seem almost random. Some countries rise, then get mired in the middle income trap. Some never prosper, some prosper and then decline. Most of it depends on whether they can create and then sustain a relatively healthy, unadulterated, steep effort-reward curve. Alas this is not the innate tendency of the voter-lemming. Therefore few, very few get it right. The rest peel off into dead end branches of the prosperity evolutionary tree,. Reminder: The world on average is growing by 4% annually. Any country that cannot match this trendline rate is, by definition, in deterministic decline. While the U.S. is #1 in the world in defense spending at almost $600B, the Netherlands is #23 at under $10B, Norway is #29 at $7B, and Sweden comes in at #34 spending just $6.2B. Now, given that those European countries are much more likely to actually be attacked by a foreign power, how can these countries spend so little defending themselves? Maybe they can spend so little, and thus spend so much on a welfare state, because they know that the U.S. will defend them against the Putins of the world. Seeing how they are held up as models by the so-called progressives, I say cut them loose and let them defend themsevles.